Lately we’ve been writing about the negative correlation between the equity market and the precious metals market. This phenomenon has been in place since summer 2011 and has re-emerged in the past few months. Since Nov. 23, the S&P 500 is up 8% while the gold shares are down 14%, silver has lost 11% and gold 7%. For those who have studied history, this should not come as a total surprise. From 1972 to 1977 and November 2000 to July 2002, precious metals and the equity market trended in opposite directions. We’ve postulated that precious metals and the mining shares won’t begin a new bull phase until the cyclical bull market in U.S. equities ends. We don’t expect that to happen immediately, but there are some important signals beneath the surface (with the safe-havens) that we should direct our attention to. First, let’s take a look at the recent activity in a number of markets. From top to bottom we plot Silver, Gold, GDX, TLT and the U.S. dollar. 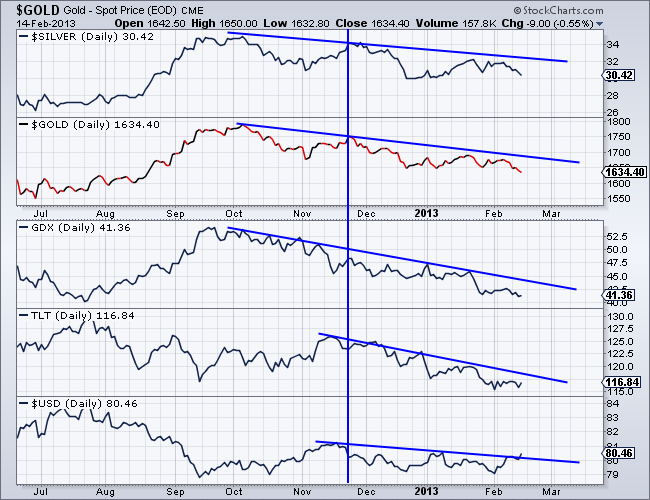 The first three markets have been in a downtrend since the end of September. Meanwhile, TLT and the buck began their downtrends in the middle of November. It appears that these markets have been tightly connected since the end of November. That is the bigger picture. The short-term term picture shows the U.S. dollar potentially breaking out and bonds not breaking to a new low.